How Much Do You Know About Fall Harnesses? Increasingly, health & safety professionals find themselves the dubious owners of a variety of software tools and large-scale software systems. These tools and systems serve a variety of purposes, from assessment to measurement, to data management and analysis, to large-scale EH&S program automation and administration. Sawn fingers, severed limbs, crushed torsos, and blinded eyes are among the many and sometimes deadly injuries common to sawmill work. 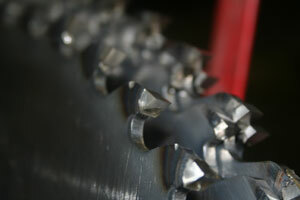 Today’s laser-enhanced, electronically operated blades are a far cry from the water-powered saws of yesteryear, but the industry’s hazards have remained largely the same since the nation’s first mill was built at Jamestown, Va., in 1608. Four hundred years later, OSHA still considers sawmilling one of the most dangerous occupations in the country. Kimberly-Clark’s Conway, Ark., plant reduced its musculoskeletal incidents by 50 percent following installation of an on-site Employee Maintenance Center (EMC). Improvements in reportable incident rates have continued each year since the EMC launched in 2004. At a sister plant 20 miles down the road in Maumelle, reportable incidents fell from eight to zero in the year following the launch of its center. We see horrifying images everywhere: devastating ice storms, hurricanes, traffic pile-ups, crumbled buildings and sinkholes, mall shootings, and sometimes catastrophic workplace accidents. Are your workers really prepared to be safe? (And what about the looming threat of a widespread pandemic flu?) We are living in an instant-access, drive-by world these days. When we need a set of gloves, a first aid kit, a faceshield, or a respirator, we stop by the local hardware or big-box store and get it immediately, or we order online and await delivery within hours. Viewing icebound Oklahoma landscapes last month should have given us pause: What if there are long-term, serious power and traffic interruptions? I’d like to know the true cost of OSHA’s final rule on paying for PPE, which was issued the same day I wrote this column. The Lean Sigma Scorecard brings together the best of Lean Enterprise thinking, Six Sigma processes, and the Balanced Scorecard’s multiple perspective management. It combines the use of data to deploy strategy and drive improvement, as well as streamlining internal processes and procedures to maximize efficiency. The Lean Sigma Scorecard framework is uniquely positioned to address many of the shortcomings in traditional safety management.